River Dance Lodge invites you to host the celebration of your marriage on the banks of the Middle Fork of the Clearwater River, and near the million-acre Selway-Bitterroot Wilderness Area, a nature lover's paradise. Not only a spectacular place for your outdoor wedding ceremony, but River Dance Lodge also offers accommodations in handcrafted log cabins and glamping tents, catered riverfront dining and activities for you and your guests. River Dance Lodge has received many accolades including a spot on the National Geographic Traveler "Stay List" of 150 Hotels You'll Love. Voted by travelers (and wedding guests! ), we are #1 on TripAdvisor for Specialty Lodging in Idaho. We are also a member of Unique Inns, which is a collection of the finest bed and breakfasts, boutique hotels and country inns on North America's West Coast. 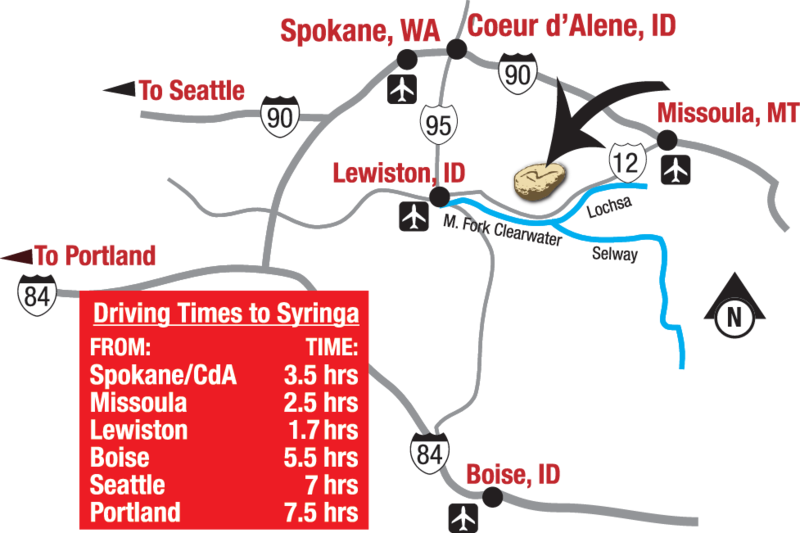 Located on Highway 12 near the town of Kooskia, Idaho, the River Dance Lodge is a two-hour drive from the Lewiston airport, two and a half hours from Missoula or about 4 and a half hours from Spokane. River Dance Lodge caters wedding rehearsal and reception dinners for 20 to 100 guests (download wedding packet below for menus). We are a destination wedding venue, of which our cabins and tents can accommodate a maximum of 70 guests. We also have beautiful camping sites available on our grounds. If you are planning on having a larger wedding, there are other nearby lodges and B&Bs that can accommodate your guest overflow. If you are looking for a unique, adventurous wedding venue in the heart of Idaho that will give you memories to last a lifetime, we believe that River Dance Lodge is the perfect place for you. View our Facebook Wedding Photo Album. Follow River Dance Lodge's board Weddings at River Dance Lodge on Pinterest. So are you interested yet? If so, download our wedding venue packet below for prices, package options, dinner menus and more. Please complete the form below to download our wedding venue packet. Items marked with (*) are required.